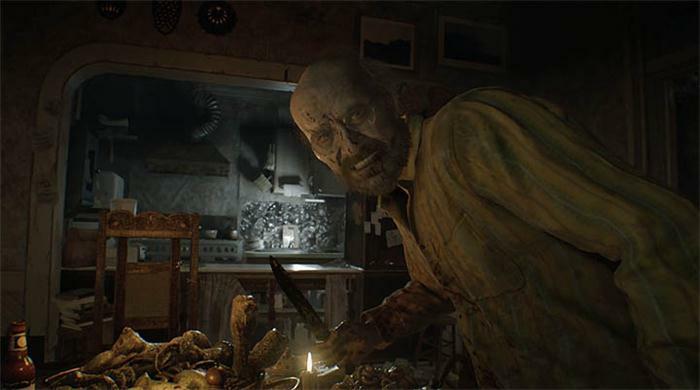 In this guide you'll find instructions explaining how to open the locked door that leads to the Main Hall in Resident Evil 7. 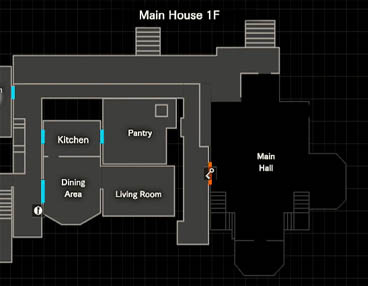 At this point in the game you will see the following objectives: "Get out of the house" and "Get to the main hall", once Zoe has hinted that the Main Hall is your route to escape. The image below shows what the door looks like. It has two large circular panels, one gold and another one metallic/silver with ancient carvings drawn on the surface. 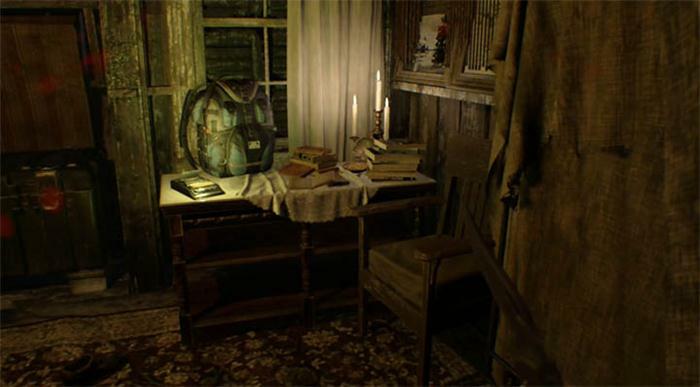 After escaping from Jack via the hatch door and crawling through the tunnel underneath the house you came to a small room (the laundry I think) where there was a nice convenient save game cassette tape and a crate to store some of your abundance of inventory items. 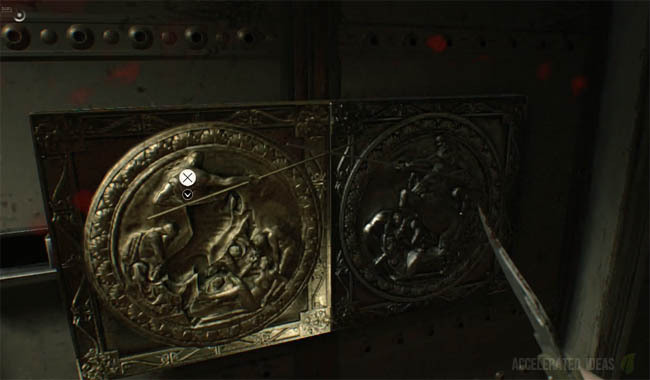 "Shut up and listen if you want to stay alive"
"You gotta get out of that house"
"There might be a way through the main hall"
Now your immediate thoughts at this stage in the game are to try and get the main door open with some kind of key, but trying to open the door shows the following message: "There's no keyhole anywhere". Let me just put you out of some of your misery now, it's not time to open that door just yet! If you want to avoid any potential spoilers then my advise is to continue searching the house for a new character, and a chance to acquire something important. Then come back to this guide when you're stuck trying to open the door again...there's still something important to find but keep progressing the story until you absolutely must open the door again. Until now the garage door control panel (south western side of the map) has displayed the dead end message when you try and interact with it: "It's secured with tape that can't be removed by hand". Work your way towards the window of the dining room (where the feast was) and a policeman will appear briefly. He gives you a knife to help you fight on and not only will this item help protect you but it's also the only way to get into the garage. Head down the small flight of stairs and cut the tape that's obstructing the garage door controls. Head inside for a great boss fight! Examine the frame by rotating it until you see the back. 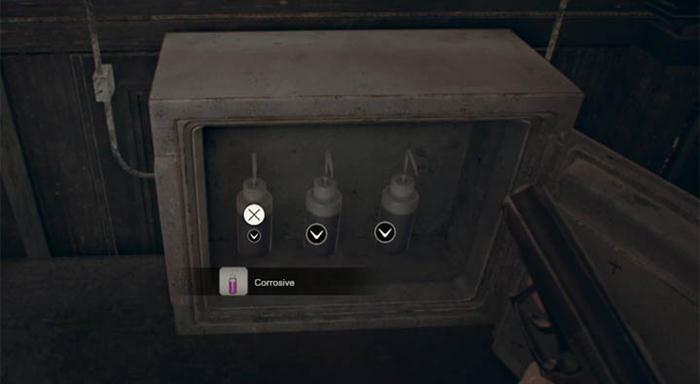 The little icons will appear to signify that there is something else that you can do with this item. Press the interact buttons again (X for PS4) when the time is right and you'll undo the screws behind the picture frame. Pull out the Ox Statuette. Now head back to the locked door which leads to the main hall and place the Ox Statuette into the empty hole. The door is somehow mysteriously unlocked and you have access to another even great section of the game. Good luck! !